Best CNC for milling/routing wood? 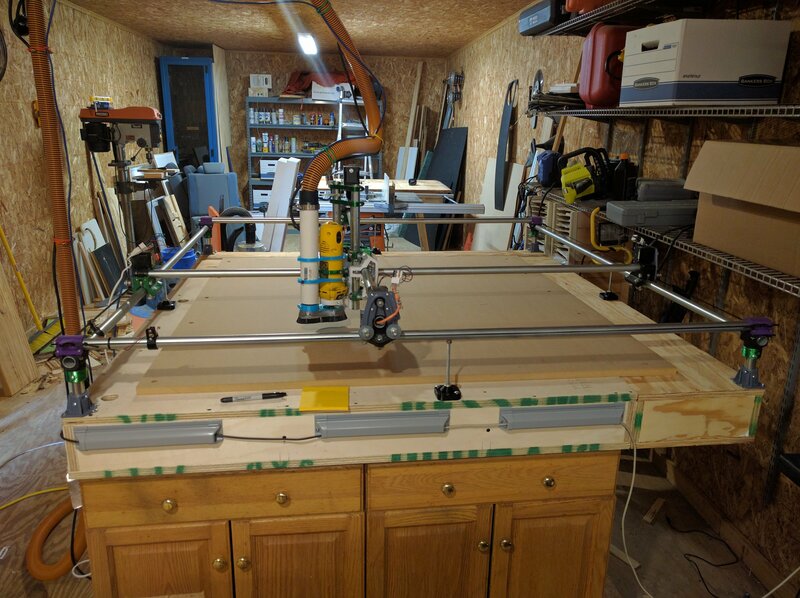 This may be a bit off-topic, but now that I have a CNC for making PCB's, and now that I have a 3D printer on order, the next thing to consider is a more serious CNC for milling/routing wood. Anyone have recommendations? Well, we looked into this for our local Makerspace. Especially if you're in the US, the Shapeoko or the Xcarve can be somewhat price effective, particularly when they have their sales campaigns and include the dewalt router and free shipping or whatever. But I still think the Xcarve is a bit flimsy and mostly propped up by a successful campaign in social media where they gave away machines to well known youtubers. In the end we opted for building a rack and pinion RawCNC instead. Unfortunately the guy behind the project keeps changing his mind constantly about how to sell machines, kits, parts and plans so I don't know how practical it is to start a build right now. It all hinges on finding the parts like the aluminum extrusions. In the end we didn't want a timing belt machine. And we wanted a vfd / spindle solution from the start not having to go through a dewalt / makita router first. These spindles are quiet and you get standard ER collets. But they are also really heavy and might not work on a standard Shapeoko without reinforcements. We opted for a 2.2kW air cooled model. Looks very nice. The rack and pinion approach does seem appealing. What a pity that rawcnc doesn't sell a complete kit. I don't see much leverage in having just the plans and then needing to source every single part individually from who knows where, only to hope it all fits together. The Shapeoko XXL is in the ballpark, but it does use a timing belt instead of the rack and pinion. @neverdie For 3D printing, belts are fine. When you are dragging a router around, you would think that the belts would stretch over time and become loose. Seems like it might be a lot less expensive, when fitted out, than the Shapeko XXL, but a comparable build area. He bought a couple kits, but ended up making his own, almost from scratch. He concludes that none of the kits that he's aware of are worth recommending. It confirmed my suspicions about unsupported rails. The RawCNC uses rods that are glued or pressed into a shaft clamp and then a u-groove bearing on top of that. unfortunately yes the same point in 3d printer field.. It does indeed look very sturdy. The end result is massive, though, and so he uses relatively large motors to move it. He did do a smart thing though which was ordering his extrusions from 80/20, who, it seems, did the cutting and drilling according to his instructions and so delivered the frame ready for final assembly. @neverdie Yeah that is a surprisingly good machine as it seems to be built from scratch with no plans or whatnot. It says in the Youtube comments that he spent $4K-4.5K on it though, with 1K of that being for the extra cost of servos as compared to steppers. Nice to have those linear rails and ball screws though. By comparison the machine we're building is maybe $2K. It will have worse precision (than ball screws) as it is rack and pinion. But a work area of ~100x150cm. It says in the Youtube comments that he spent $4K-4.5K on it though, with 1K of that being for the extra cost of servos as compared to steppers. It's not clear to me why he chose servos, unless, again, it was a step to further bolster the effective rigidity. Their "Pro" version appears to be a highly rigid variant of their standard edition. Which leaves me wondering: how do I decide between a standard machine and a pro machine? In some sense, more rigid is better, but it clearly comes at a cost, so how rigid is "good enough"? Since maybe that is a tough question to answer, perhaps the ideal kit would be one where one starts with a cheaper "standard" machine, but where one can easily upgrade it to a rigid "pro" machine by simply adding additional parts. That would minimize the risk if one discovers that a standard machine just isn't rigid enough. So far, I haven't seen such an easy-to-upgrade kit, but maybe one exists? Or you could try a MPCNC link text. I'm just finishing one myself. @rfm69 The link you supplied, "https://forum.mysensors.org/topic/9034/best-cnc-for-milling-routing-wood/vicious1.com", isn't working. Hmmm. That does look clever. I suppose one could scale it to use whatever bigger/stronger pipe might be needed to make it rigid enough. Pipe/tubing is usually plenty cheap, so I guess it might even be affordable. When will you be done making yours? I'd love to hear how well you like it. The MPCNC is a smart project but I would assume it would struggle with a bigger motor. The 2.2kW we are going to use weighs A LOT. Around 5kg at least I'd guess. The 1.5kW is not much better. With a smaller spindle, or router like a Kress things would be different. Still I'm glad to have the extra power, and standard ER20 collets up to 13mm. Plus these chinese spindles are really quiet compared to a regular router. And the speed can be set and spindle can be started from the control panel or from the computer. The downside is the low quality VFD I guess, but if it works it works. And you can always use shielded cables everywhere. I bet that diameter of unsupported tube would be a fail, based on what we saw in the earlier videos. However, if you were to fill those flimsy tubes with self-leveling mortar/concrete, maybe even with a piece of re-bar running down the center of it, I bet they'd become a lot more rigid.... Maybe then you could keep the same size. Also, would box tubing be more rigid? Seems like the same design idea could be adapted to that. I can imagine that a box geometry might even stabilize the spindle more (keep it from going ring-around-the-rosie like maybe it would on a circular tube). Well, anyway, until someone proves otherwise, I'm going to assume a supported rod/rail is the way to go. At least that has been proven to work reliably using straightforward techniques. @neverdie Yes thats the one... I'm got it working but am waiting a few things by post to be able to connect the 3d printer. And then I need still to order a new spindle. There are some modifications people have made on thingyverse to strenghten the Z access to take heavier spindles... you can redesign the connecting corners and just print them out. I'd like to get a 1.5kw spindle, but might just get a small one to begin with. @neverdie They've already answered the concrete idea, many people consider that, but a simple center support I think solves the problem. They have nice forums over at the vicious.com link I shared. @neverdie The same web site has a few other designs for larger machines. The rods that move, though, remain unsupported, especially in the middle. What about those? Hmm.. That Low Rider MPCNC does looks interesting. They're using just two stainless steel tubes for that. Should be relatively cheap to make, and it can handle large formats. @neverdie Generally I get the feeling from reading other peoples experience that its a mistake to quickly make the machine too big because of rigidity. But people do make mods to address this issue or to add heavier spindles. But to change the size just need to get new pipes which even if you use SS they are they cheapest part. same here, a while I'm looking at the MPCNC. 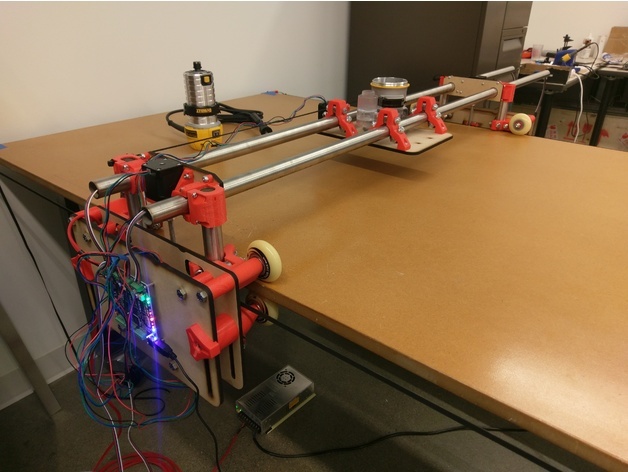 It's a nice and affordable project when you want to build a cnc. Unfortunately never jumped into, because I have different requirements, need something more "powerful" for my job, not only for wood or thin sheets. @scalz Do you have a CNC? If so, which one did you pick? no, I haven't yet. still studying because i'll built mine, custom I think (inspired from multiple builds), for my job I need stronger than mpcnc (so far asking local subcontractor when I need it). 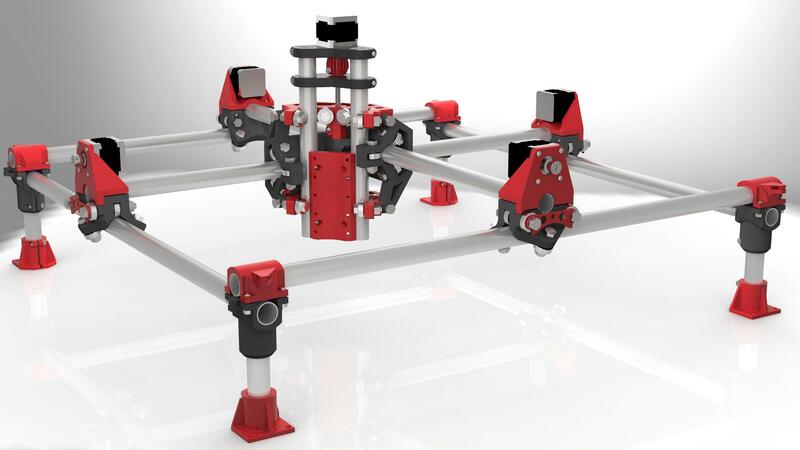 if it would be for personal use, low cost, for soft materials, no speed concern, maybe I would pick the MPCNC as I already have a 3dprinter for printing parts (I think i've maybe just a few missing parts to build one though). Yes but can he do this? @bjornhallberg I'm sold! ... except I'm not, because they won't sell a kit to anyone in the United States. Go figure. I don't understand why. @bjornhallberg Any estimate on the cost of mechanical parts ? @rfm69 I think the mechanical stuff is ~$1400 and then ~$600 for steppers and spindle and a few other things. Of course the machine we're building at the makerspace is the biggest suggested model. Working area ~100x150cm with steel reinforced Y and X and with laser cut steel plates instead of aluminum. So I don't think he ever sold that as a kit internationally because of weight and size. A smaller machine would be much cheaper obviously. @neverdie Yeah the guy behind the RawCNC has been a bit difficult. This is sort of his side project and he keeps changing his mind on how to proceed. He actually rolled back some of the features to make the machines lighter and easier to ship. But then he didn't sell internationally anyway. At least not for long. @bjornhallberg Thanks for the info, I got a bit frustrated trying to find this on the rawcnc website... i was in some loop, very frustrating. This shipping costs, can be a big factor, so I do understand, but the openness and transparency or generally communicating well, which you don't get at all from most china suppliers, and some closer is just as important. I think the mechanical stuff is ~$1400 and then ~$600 for steppers and spindle and a few other things. Seems like a very good price for the rigidity and such a large format, at least compared to other offerings.